We made the switch from plastic to stainless steel drink bottles a few years ago, and have given a number of different brands and sizes a go. Here’s what we think about the different ones we have used. Stainless steel drink bottles are made from thick but light-weight food-grade 304 stainless steel. They will never retain or leach flavours. They are a much safer alternative to plastic. 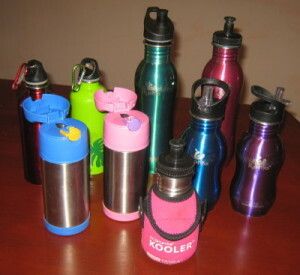 Plastic drinking bottle are usually made from Polycarbonate, which is virtually shatterproof. What makes it so strong is a plasticiser commonly called Bisphonel A (BPA) which makes it easy to mould. An environmental oestrogen, research has shown that low-dose BPA exposure can cause hyperactivity and adverse changes to the reproductive system. Our first foray into stainless steel drink bottles was with a couple of 500mL Cheeki bottles. At ages 2 and 4 I found that I needed to unscrew the lids for the girls as it was a bit hard for them to do, and the lip wasn’t wide enough to put in iceblocks. Being very slim bottles, I’ve ended up using them more than the girls, slipping one into my handbag when going out. There are smaller, more kid-friendly sizes available (though the business we bought the bottles from didn’t stock them), which might have been more suitable. But the small lip size has been the thing that has seen these bottles receive the least use in our household. We next tried the 500mL Thermos Foogo Straw Bottle, which had a push-button flip top lid and a straw. My 4 year old could open it easily, but the little one lacked the strength initially to open it herself. These bottles were well loved, and their very wide lips made it simple to add ice blocks. The down side was the straw and mouthpiece, which I needed to replace fairly regularly; they were parts that I needed to order online as the local business I bought the bottles from didn’t stock replacement parts, so the cost was prohibitive to keep doing so (the postage moreso that the straw!). We also had to replace one of the lids as it cracked when the bottle was dropped. So these bottles were regretfully shelved as a little too high maintenance for us. The third brand we tried was EcoTanka; this time I decided to try the 0.35L “Teeny” Tanka. While the rim wasn’t as wide as that of the Foogo, it was still wide enough to accommodate the large iceblocks our Tupperware ice tray makes. Enter the 500mL H2Onya bottle with “flip and flow” lid. With their bright colours, a non-spill spout that is easy for little ones to open and close securely, a wide enough lip to put in large ice blocks (it is the same width as the ECOtanka bottle lips, so you can mix and match lids from both companies), and an ergonomic design that makes the bottles easier to hold, these have remained our favourite. I was pleasantly surprised to discover the H2Onya is actually a West Australian business, based in Fremantle. There are neoprene covers available to insulate the bottles, but we haven’t found it necessary at school. To date we haven’t had to replace the straws in the bottles, but when we do, they are available locally. So my girls will be using these bottles at school again this year. do you notice any metallic taste in these bottles. I bought a cheeki bottle, but when I checked at home after rinsing it I noticed an orangish stain so now I am a bit concerned. Has H2onya lasted you a fair bit with out rust, metallic taste, colour change (inside) etc?